Hi Dare 2B Artzy fans! How is everyone’s Wednesday going? There are two upsides to it being Wednesday. Number one, you’re half way through the week and number two, I’m back today with another fun Halloween Card. I’m so excited for fall and Halloween, Thanksgiving and Christmas. I absolutely love this time of year!! 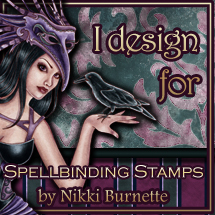 Today’s card features this adorable Witch from the Witches Spell stamp set. I’m a total sucker for cute Halloween stamps and I really fell in love with this witch when I first saw her. She’s so cute and I knew I couldn’t wait to color her up and make a cute Halloween card with her. To start, I cut a piece of Neenah Solar White cardstock to 5 inches x 10 inches and scored the long side at 5 inches. This would be my card base. Next, I used a die to cut a large circle that is 3 inches in diameter out of another piece of white cardstock. I placed it over the front of my card base and centered it. I took a pencil and traced around my circle very lightly. This gave me a guide so I’d know how far into the center to ink my card base. To create my moonlit background, I sponged on some inks in several shades of purple, dark blue and a bit of black. I blended my inks using darkest colors on the outer edges getting lighter towards the pencil outline in the center of my card base. I wanted to create some shiny, sparkly stars in my background. To do that, I used my MINC toner ink pen and dotted on some of the ink onto my background. The ink for the pen is a little thicker than marker ink so I set it aside to dry. Next, I sponged my white circle with a couple shades of yellow and a light amount of black to create some shadows to transform it into a full moon. I stamped the witch from the Witches Spell stamp set and colored her using my Copic markers. I even put a bit of a purple streak in her hair just for fun. Once I was finished I fussy cut her out. I left a bit of a white edge around my witch and I colored it yellow to make it appear that she is backlit from the moonlight. I also stamped and fussy cut the bat from the set. I added some Black Spectrum Noir Sparkle pen to the bat and also the cute Witches Hat which makes them sparkle so much as you can see from the photo. My card base was finally dry enough to run through the MINC machine. I placed a piece of silver foil over my card base, making sure that the entire front was covered. Next, I placed the foil covered base between a piece of folded cardstock and ran it through my MINC with a setting of 4. I typically run my images through the machine twice, just for good measure. Once the image was cooled, I peeled off the foil to reveal the starry sky. Foiling is such a great way to add interesting details to your cards and now with all of the available colors of foil you can do so many cool effects with your projects. I added on my moon, witch and the bat to my card base using some dimensional foam. The sentiment, Trick or Treat was stamped with Versamark and heat embossed with some white embossing powder and die cut it with a fishtail flag die. I added some sparkly white dimensional dots complete the look. Hope you enjoyed my card today as much as I enjoyed creating it. If you’re making Halloween Cards right now be sure to check out the super cute Halloween stamps in the Dare 2B Artzy store, there’s quite a few to choose from. If you like this adorable witch from the Witches Spell set it is on sale right now in the Dare 2B Artzy store so grab it while you can. Be sure to check back on Friday as we’re having a fun Christmas themed blog hop to inspire your upcoming holiday cards and projects. It’s going to be a lot of fun and you’re sure to find lots of holiday inspiration from everyone on the Design Team.